On Tuesday, a 29-year Southwest Airlines employee, Michael Winchester was shot and killed while arriving for work at Oklahoma City’s Will Rogers World Airport. Beginning immediately after Michael’s passing, the outpouring of compassion for his family and coworkers at OKC has been incredible to watch. Southwest’s CEO Gary Kelly even took to Twitter on Tuesday, saying, “We lost a cherished Southwest Employee today in an act of violence in Oklahoma City. You all can rest assured that we will do everything we can to support Mike’s family.” It was even more sad to later learn that Winchester’s life was taken by a former Southwest coworker, who left the company last year. 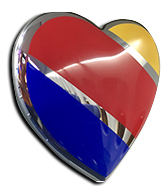 As a fifteen-year Southwest Employee myself, I’ve witnessed and experienced this intense level of care first-hand for co-workers during times of extreme illness, or when any of their loved ones have passed away. I’ve seen fundraising efforts of every type, from baked goods to golf tournaments, to help defer medical bills. I have no doubt that this week, Southwest has arranged for the transportation of Mike’s family to attend his funeral. The company flew its flags at half-mast on Wednesday and Thursday at our Dallas Headquarters. There’s also an internal “In LUVing Memory” tribute page where Mike’s friends within the company can go and leave their thoughts and memories of him. After only a couple of days, it has hundreds of very moving tributes. Southwest does this with each current employee who passes away. While I never got to meet Mike, his job role was very similar to mine, and we worked on the same planes, with the same goals to accomplish. So his death really did impact me emotionally, as I realized something like this can happen at any time. But it was also comforting to know that his family and coworkers are being supported so strongly. Working in the airline industry, there is a constant camaraderie. Maybe it’s the bond of working with sometimes crazy passengers, or the fact that we successfully shuttle millions of people around the earth safely, every single day. I don’t believe this post-tragedy compassion is unique to Southwest. Airline employees often offer assistance to their colleagues at other carriers. Notably, after 9/11 when flight crews were stranded away from home, dozens of stories popped up where flight crews rented cars and road-tripped back home, in some cases, even with passengers. Southwest founder Herb Kelleher has given us many well-known quotes over the years but this is one of my favorites: “If you’re crazy enough to do what you love for a living, then you’re bound to create a life that matters.” There’s no question that many of my industry colleagues approach our jobs with a sense of duty that surpasses earning a paycheck, which is why we band together in times of need and sorrow. Paul Thompson is an airline industry veteran, specializing in airlines, general aviation, aircraft manufacturing and the travel & hospitality industry. He lives in Denver, Colorado and is always looking for his next aerial adventure. He also enjoys photography, and finding local craft beer wherever he travels. You can follow Paul on Twitter (@FlyingPhotog).